TechnoVisual are set up to supply CD and DVD duplication or replication, full colour or black only disc printing, plus high quality packaging. Please see our Disc Packaging Page for more details and pricing on all the package types we can supply including: Digipacks, Digifiles, Digisleeves, Lancing packs and Card wallets. We can even supply Vinyl Pressing and Packaging if you're interested - see Vinyl Page! Excellent quality, costs and turnaround times for both short and long runs. TechnoVisual provides short-run and large volume, high-quality media duplication, printing and packaging. 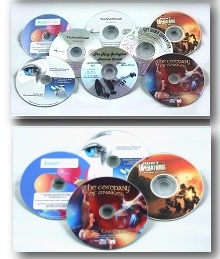 We can offer an array of CD, DVD and Bluray Disc duplication and replication options tailored to your needs. Our duplication and printing service is fast, yet makes no compromise on product quality and we only use the best quality discs. TechnoVisual are happy to manufacture very short runs if this is required and will always advise and guide you on the best solution for your project. There is no set up cost for the duplication and printing of discs, assuming there is one set of artwork per run. Call us now on 01280 815161 for a very competitive quote, fast turnaround and personal service, including fast courier delivery. Please see our guidelines and process requirements, shown in maroon text at the bottom of the page, we will supply any templates required for artwork. Are You An Artist, Band Member or Small Independant Record Label? We work closely with many artists and small record labels. We know it isn't easy to arrange for the production of a run of good looking CD packs to sell at gigs and a set of professional looking promo packs for sending out to protential venues and radio stations. We can help! A offer a 'White Label' CD in a plastic wallet for just £1.00 each (quantities from 30 and above). Add a printed insert @ 40p each to make a good value personalised package with room to add photos and track listings. Our digipacks and card wallets are great quality, good looking packs, which can be sold including disc at a good profit. Visit our Disc Packaging Page to see the huge range we can supply at TechnoVisual. Black thermal title print option - Durable, waterproof print, great for titles and simple images such as logos. Printed onto a white or shiny silver disc, please layout your artwork on the template supplied and keep minimal and as high quality as possible for a better print (300dpi minimum). Please ask for the correct template and instruction. Thermal print is used for simple images & horizontal text Maximum 50% disc coverage. Remember that this type of print is black only - it can not be used for colour or grey-scale. Ring images or text around the edge of the disc will increase the cost - This print method uses a roll of film rather than inks, similar to a fax printer and text or a ring image around the edge of these discs uses the maximum length of film. Horizontal lines of text or a small area of curved text at the bottom of the disc is ideal, but if you need to add text or a black border around the full disc edge we would increase the cost by an extra 10p plus vat per disc. Full colour disc printing - Great for photos and other detailed images and text. Either with a matt or gloss lacquered finish. Longer run discs are either litho or screen printed. Most shorter run colour printed CDs and DVDs use ink jet print, which is water soluble, so please store in a cool dry environment. TechnoVisual can supply short run colour printed discs with a durable waterproof gloss lacquer, see further details on various disc types in the table below. Please call and we will send the correct template for the disc you require plus all the guidelines and instruction you will need. Our colour print is extremely high quality, but please make sure your artwork is of a high resolution, at least 300dpi. We can accept most file formats, e.g. jpg, pdf, png, psd etc. Alternatively we can set up the artwork for you if you give us the instruction to do so. Our design/layout charges are based on rates of £35.00 plus vat per hour. i) High Grade CD manufactured with a full black burn side and white printable surface, which takes a full colour print with standard matt finish. 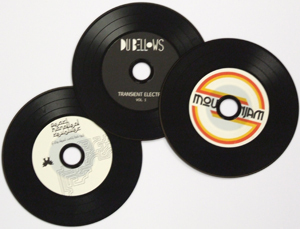 Could be designed to look like a record with black grooves and inner printed label @ 88p plus vat each. NB: Black burn side CDs are more sensitive than most because of the black colouring to the burn side of the disc, but they do play well in good quality, more modern players. We only sell one make of vinyl CD 'Ritek', which in my opionion is good trusted manufacturer. See our 'Disc Packaging' page for many other printed package options. TOP OF THE RANGE DISCS WITH PHOTO GRADE PRINT SURFACE - TechnoVisual stock very high quality CDs and DVDs both for colour and black only thermal printed discs. Examples include Taiyo Yuden, Falcon Medical Grade and Ritek, the Taiyo Yuden CD has a special high quality cyanine die, which gives these discs a blue/green burn side colouring, and the Falcon and Ritek discs have a true diamond silver burn side, resembling shop purchased CDs. White Print Surface - Matt Silver suface is also available, this can give a cool metallic effect with some artwork. THERE IS NO SET UP CHARGE FOR DISCS. WE ASSUME THAT THE ARTWORK PROVIDED IS THE FINAL APPROVED VERSION AND OUR INSTRUCTIONS HAVE BEEN FOLLOWED REGARDING SUBMISSION. FOR ORDERS OF LOW VOLUME DISCS (NO PACKAGING), WE CAN SEND A ONE-OFF PROOF DISC COPY TO YOU VIA POST FOR YOUR APPROVAL IF YOU WOULD LIKE TO SEE AND LISTEN TO ONE, A ONE-OFF PROOF DISC IS £5 PLUS VAT INCLUDING DELIVERY. PLEASE NOTE THAT OUR TERMS STATE THAT WITHOUT FIRST SEEING A PROOF, WE CAN NOT BE HELD RESPONSIBLE IF YOU ARE NOT ENTIRELY HAPPY WITH THE FINISHED RUN. PLEASE BE AWARE THAT MOST COLOUR PRINTED CD-RS & DVD-Rs ARE PRINTED WITH INK JET PRINT AND ARE THEREFORE SUSCEPTIBLE TO MOISTURE, WE ADVISE THAT THEY ARE STORED AWAY FROM MOISTURE AND BRIGHT LIGHT. SOME OF THE GLOSS LACQUERED DISCS WE SUPPLY E.G THE TAIYO YUDEN WATERSHIELD AND RITEK GLOSS LACQUERED CDS AND DVDS ARE WATERPROOF AND FADE RESISTENT. DISC ARTWORK AND TEMPLATES - PLEASE CALL US FOR THE CORRECT DISC TEMPLATE - 01280 815161, we will send all the guidelines and instruction required. For both types of printed disc, there are no set up costs, Please follow our guidelines when submitting the artwork. TechnoVisual will check the discs throughout the printing process to be sure that they look as close as possible to the submitted artwork. Disc copies are also batch tested throughout the duplication process. We are happy to send a one-off prototype copy of the CD printed with your artwork on to the requested disc type and duplicated with your content, if required and the charge is £5.00 plus vat per disc for this service including delivery. Payment will be required in full on acceptance of this proof, or before we start the job. NB: It is the responsibility of the customer to ensure that they are happy with the master disc before this is sent to us to use for duplication, we will simply make copies from this disc. DISC PRINTING OR DISC DUPLICATION ONLY - We are happy to do the printing on a CD or DVD for you and then leave the disc blank for you to burn your own content. We use only good quality CD-rs and DVD-rs, which should work with any up-to-date industry standard disc burning software such as Nero. We can also duplicate from your master and leave the disc unprinted, perhaps if you wish to print and add your own labels. In this case we will simply copy your content from a master supplied. See prices for supply of the disc with duplication only or printing only on the table above. TechnoVisual do offer a CD mastering service, should you require it. As described above, sending in a master CD, which you have checked and signed off is always a preferred option, but we will master a CD for you from Wav files, (or MP3 files or WMA files) if there is no other option available. We charge, £15.00 plus vat for up to 4 songs (an EP) and £30.00 plus vat for 5 songs or more (a full CD/Album). The mastering charge includes our time to download the files and burn the songs to a correct audio CD format (Red Book Format). If you require any CD text or ISRC codes we can encode your CD with this information in with the prices quoted above. Specialist software has to be used for the addition of ISRC codes and CD text and you will not see the CD text appear with every CD player, only those with compatible hardware, but we will test the master to make sure both the codes and/or text are there. We prefer that you have a proof of the master to check and sign-off after we have provided this service. If you have packaging as part of the project, a prototype will already be offered as part of the quote. DVD authoring, this service can be supplied with titling, artwork, music and menus if this is required, we would need to quote for this service depending on the exact specification required. Please call for a costing. The suggested maximum data amount a CD can hold is 650mb or 74 mins. There is some overburn on a CD-r which means the absolute limit is a bit higher (80mins), but we would not advise going over the suggested maximum. The same applies to DVD-rs, the max capacity is 4.7gb and 120mins of data but in either case we would not recommend going near this maximum as it is much more likely that duplication errors will occur and there may be difficulities playing the copied discs on older machines. Please let us know if your master includes CD Text and/or ISRC codes so that we can check that this duplicates correctly. A physical master disc sent to us via post for duplication purposes is always the most ideal option, please use a decent quality DVD-r or CD-r (or studio copy) - see our address for delivery in the maroon text below in the section headed 'Artwork and Process Guidelines' or on the Contact Page. There is only one exception to this rule, in certain circumstances we will allow the content of a CD to be sent to us as an ISO file or a .BIN and .CUE file or .WAV and .CUE, this is an actual 'disc image' and in this event we would burn the disc from these files at no extra cost. We would always prefer to send you a proof of the master disc in this case so that you can check the disc yourself to make sure that it has burnt as expected. The true meaning of 'Mastering a Disc' has been lost these days because of the variation of services supplied now by studios and online mixing companies. The studio recording your music should mix the tracks, adding any effects, compression, balancing the levels etc and then, once the final mix is ready, this should be Mastered to Disc (hence the name 'Master Disc') but we are finding that many clients come to us with an unfinished job, all they have been given is the raw wav files. We would always suggest that you ask the studio engineer for a properly mastered disc so that it can be used for duplication. We are also finding that on-line sound engineers are sending clients a file in the form of a 'DDP file format' rather than supplying a physical mastered disc, this is a preditory format and needs specific and expensive software in order to play or burn a usable master, we don't use this software as part of our duplication process. This file type together with industry standards such as Nero (NRG) and ISO files are fine for larger volume replication jobs as these formats are often used as part of their glass mastering process, however for shorter runs, the duplication process takes exact copies from a master disc instead. FOR SHORT RUN DUPLICATION IT IS ALWAYS PREFERABLE THAT YOU SEND US A PHYSICAL MASTER DISC TO COPY FROM, BOTH PARTIES THEN KNOW THAT EACH DUPLICATE IS AN EXACT COPY OF A MASTER WHICH HAS ALREADY BEEN CHECKED AND SIGNED-OFF. At TechnoVisual our turnaround times are very good both for short and long run. For small volumes of discs and packs everything is kept in-house. We will always ask if you have a deadline for us to work towards and we will always give you a turnaround time/schedule when quoting for your project. It is worth asking if we can prioritise your project but a further charge may be added if this at very short notice as it will almost certainly require a shift of schedules and overtime for our staff. TechnoVisual do ask that you provide everything we may require for your project, e.g. masters discs, artwork and printed samples, in good time so that we can keep to the agreed schedule. Should you delay in sending artwork or master discs then we can not guarantee that we can still provide the final product by the date specified and if we have to shift the schedule and work over-time, then there will be a further charge for this. Most low volume jobs including just disc duplication and printing can be completed in 48 hours from time of receipt or sign off of artwork (and receipt of master disc if duplication is needed) to completion of the run. Delivery is then made either using first class Royal Mail or reputable courier, depending on the weight of the package. Longer runs will require a longer turnaround particularly if packaging is also required, but it will rarely be any more than 2 full weeks. TechnoVisual specialises in Short Run duplication and printing in-house and we also carry out larger volume jobs where Replication is used for copying the content to disc. In order to make dealing with small quantities of discs a viable option, we use a process called 'Duplication,' which involves literally copying exactly the data from a master disc. Replication will only be used if quantities required go above 300. CD/DVD duplication the process we used for shorter runs. A duplication tower facility copies data from the master disc and writes it to a blank disc, each tower contains several CD/DVD trays so that many copies can be created simultaneously. After all the data has been written unto the blank CD/DVD-R, the information is verified with the master, and the process is complete. CD/DVD replication creates copies during the manufacturing process. Before the replication process starts, the client master is evaluated for data corruption. Then, a glass master containing relevant data from the client supplied master is created. Replication only begins when a flawless glass master is assured. The glass master is used to develop a stamper, which, in turn, is loaded into an Injection Molding machine to create the CD/DVD replicates. A layer of micro-thin aluminum is applied to the polycarbonate disc. It is then lacquered for additional protection and printed before packaging. The finished product of either process performs in the same manner and there are no noticable differences, a CD-R/DVD-R can be printed to appear as if it were a 'replicated' disc very easily, if this is the required outcome. From a short-run point of view, duplication wins the day as there are is no set up time or cost involved and therefore it has the huge advantage of speed of turnaround. Replication will always be the best choice for longer runs, once the glass master has been manufactured and a stamper produced the process of creating replicates is extremely fast and accurate. We will always advise you of the best method to use for your project. Call us for a competitive quote on 01280 815161. 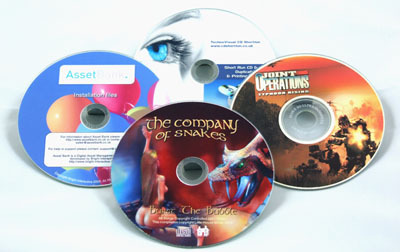 TechnoVisual stocks a number of quality products for packaging your CDs and DVDs. If you have any specific packaging requirements or ideas on how to package and present your project we will do our best to accommodate you. TechnoVisual can supply any other printing materials required for your project, e.g. booklets or posters, please see Short Run Printing. Our skilled technical and graphic designers will work with you to make sure your CD or DVD will work as it should and look good. Our team of graphic designers can help with the design and layout of your artwork both for the print on the CD or DVD face and the packaging. Our team are happy to take your graphics, text and ideas and then layout the artwork following your instruction. We will consult with you throughout this design process and send jpgs for preview in order to work towards a finished design, which you are entirely happy with. We can also include bar codes in your design should this be required. Any layout or design work will be charged for on an hourly basis and this service is charged at just £35.00 plus vat per hour. Alternatively, we can simply send you a template and instruction for the disc and packaging if you would prefer to do the artwork yourself. Our designers will then check that your atrwork will work before we attempt make up the prototype/proof, however, we do require that your final arwork is print ready. TechnoVisual will never go ahead with the print and manufacture of your package if we can see that there will be problems. We will always let you know first and if it is possible, we will attempt to resolve any issues before printing. TechnoVisual can also help with the design of bespoke and shop web sites for selling your discs and we offer a hosting, management and fulfilment service for small numbers of discs and/or packaging. We can also help with the design and printing of other promotional products such as posters and tickets, please ask for a quote. 3D Design and Visualisation - TechnoVisual uses a number of 3D design packages and we have been involved in many projects which have required 3D images or animation. A 3D design is sometimes a very sensible and economical option if the subject is a complicated design, for example a building, an engine or even an item of clothing. We can use the same image once created to show many angles and positions and various colours or textures can be added very easily. Our technical team can also help you with your audio or video disc content, ensuring your project comes to life. You will have the benefit of our many years of experience in design, video and audio production together with the additional services we offer including; photography, special effects, 3D animation, CD mastering and DVD authoring. We have an on-site well equipped studio set up entirely for the purpose of video production, audio and photography. Our technical team will deploy the finished project in a variety of formats for your website and/or YouTube, or as a CD or DVD to send to clients as a powerful marketing tool, or perhaps for use at exhibitions, either way we are sure to achieve a result you will be proud of. There are a lot of misunderstandings and misconceptions about DVD playability worldwide. Many sellers say that DVDs will play on any DVD player, when this may not be the case. Most of the problems concern US and Canadian buyers who have a DVD and TV system called NTSC, whereas most of the rest of the world has a system called PAL. The differences in systems are explained below. Simple incompatibility of systems/regions can prevent playback or the disc may play but with a distorted or jumping picture. The onus is always on the buyer to ensure they have a compatible DVD and TV system. Sellers cannot know which system a buyer has or whether the DVD is being purchased for themselves or as a present for somebody else. Hopefully this guide will help DVD sellers understand compatibility issues. At the end of the day sellers want happy buyers and buyers want a DVD they can watch. All Region 1 DVDs are NTSC format. DVDs from other Regions may however be in either PAL or NTSC format. The main difference between North American systems and other countries is that other countries' TV systems can play either PAL or NTSC DVDs whereas many US and Canadian TVs are NTSC only. Most North American DVD players are NTSC Region 1 only players. Film on a DVD is stored in digital format, and is formatted for one of two TV standards (NTSC or PAL). So apart from the region code issue there is the problem of disc format (two different formats of DVD, NTSC or PAL). The UK, Europe, Australia, etc use the 625 line 50Hz PAL system. Japan, USA and Canada use the 525 line 60Hz NTSC system. If you can't play a PAL format DVD, although you have a multi-region DVD player, it's possible that your TV is the problem and not the DVD. Most DVD players and TVs sold in PAL countries can play both formats of discs, however, this does not mean they can play any DVD (because of region restrictions). For example, a basic European DVD player (PAL Region 2 only) will be able to play a Japanese disc (NTSC Region 2), but not a US (NTSC Region 1) disc. An American basic DVD player (NTSC Region 1) will not play any other Region's DVD irrespective of format. Many people have multi-region DVD players. People in regions other than Region 1 who have a multi-region DVD player can play any region’s DVD in ether format. Americans and Canadians however may have a multi-region DVD player, but if their TV has not been converted or is not PAL compatible then play will be affected. Most North American DVD players can't play PAL discs. Basically if North Americans want to purchase DVDs from around the world then they must have a multi region DVD player and a PAL compatible TV system; or be willing to watch the movie using a pc/laptop's DVD ROM drive (pc's are not format dependent. 1. A multi-region DVD player. 2. A PAL compatible TV set or a PAL/NTSC signal converter. Or alternatively you can watch a DVD via your DVD ROM drive on your PC/Laptop. The British, Europeans and Australians really have few problems playing any countries/other region DVDs in whatever format as long as they have a multi-region DVD player. Hope you've found this guide helpful! Templates, Set up of Artwork and Getting your Artwork to us. Emailed proofs are always free of charge and but we do insist that you accept our proof or full prototype service for most of our printed packaging e.g. jewel cases digipacks and printed wallets. Afterall, this way you can be sure of your package and how it will look and feel before committing yourself to the full print run (see details in section below). TechnoVisual are happy for you to provide your own artwork and we will give you all the support you will need, as long as our templates and instruction are used and that the final submission fits in with our requirements/guidelines for printing. 3) Please do not take any text or graphics too close to the cut or fold marks - if possible leave at least 3mm margin. Most of our templates show this 'safe area' and we would ask that all text and important graphics are kept within this area, it always looks bad if text especially is taken right up to the edges of the pack. 5) The main printers we use here are digital CMYK printers, although they will simulate RGB very accurately as well. Therefore we would prefer that artwork is sent in CMYK mode although this is not essential. The digital printers we use (both Xerox) print to a high resolution and have a good colour profile set up. Our main printer has a sophisticated Fiery Rip system on board which deals with colour profiling and enables us to control the set up for each file printed to give us a very good likeness to the colours seen on the computer monitor, however, this may differ considerably from any print out you make on your printer, colours can vary hugely depending on the type of printer used, the quality and type of inks and the colour and type of media used. We do change the printer settings if we think this will be of a benefit to the look of the artwork and we probably spend more time than most printers ensuring that we get as high quality and colour accurate print as possible. If you are concerned about the colours on your print, it may be an idea to print out your artwork first to your taste and then send in this print so that we have a physical print to match to, however, any excessive time spent on colour matching will incur further charges. If your print requires an extremely high colour and print quality, we do have very high spec inkjet printers and photo quality media here for this purpose, however, using these alternative methods will mean that the prints will be charged at a higher cost per item. 8) THERMAL BLACK TITLE DISCS - For black titles and simple images such as logos (black only no greyscale). Please input the text and simple images using the template we supply and leave a good margin round the edge of the disc and at the hub area. This type of print is not meant for detailed images such as photos and we can not use it for full disc coverage e.g. a full black background (50% coverage max). Lastly, should you want to add text or an image in a ring around the edge of the disc, the cost will increase as this is equivalent to a full disc print for this print method. We can either use shiny silver or white discs. 9) ARTWORK FORMATS - The best format to use for your artwork is a PDF files as this is the preferred format used by digital printers, though we can deal with most, if necessary. The file can be flattened or compressed but try and keep it as high quality as possible and please remember to either take out the template layer or make it invisible. If you send us a layered/editble file we are happly to make any small tweaks if it aids the print output but we will always tell you first and we will never change your artwork without telling you, we always prefer that any changes which may be required are done by the client or their designer. 10) COPYING COPYRIGHTED MATERIAL If you are going to use covers of songs written by other artists or full songs or music recorded by the original artist in your production, then you will probably be subject to copyright laws, even if you are not selling the CD or DVD copies. It is the client's responsibility to make sure he has the correct license when making copies of copyrighted material. Please refer to the Music Licensing page of the TechnoVisual website, which describes in plain English everything you need to know about the MCPS licensing for using copyrighted material. Please allow for this cost in your budget. We also ask that you do not use copyrighted images from the internet without buying the license to use them. We are not allowed to print copyrighted material. c) Use a file share service like Mailbigfile or Yousendit, or Dropbox, this method also allows you to send large files easily and quickly at no charge. Alternatively if you have access to FTP, we can give you details to upload files to our server. just give me a call for this option on 01280 815161 or 018450096147. Make sure you let us know when you have uploaded anything to our server. 1) by credit/debit card over the phone - 01280 815161. (We do accept Amex cards, with a charge of £1 per transaction). Whether we supply the artwork or you prefer to send a final version of your own design, once the printed item has been proof read and approved and payment made, we can not be held responsible for mistakes in text or layout. If you wish to send in your own designs, we strongly suggest that you are as sure as you can be that you are sending us the final version. Any further changes or adjustments will incurr further set up charges. TechnoVisual do not charge any set up fees for printing and duplicating discs alone. It is still a good idea to ask for a proof copy if you are not 100% sure that the master is as it should be, this will then give you the chance to listen through to the copy as well as checking any printed artwork. We would always suggest that you check your master before sending it in to us, we can not be held responsible if there is a problem with the finished discs which has arisen from your master. Although we batch test to make sure the copying process has worked well, we can not be sure how the master should sound and we will always make exact copies of the master supplied. For some packs such as very simple printed inserts for plastic wallets, we do not insist on a prototype, however we always suggest that a proof is a good idea. If you do not see a prototype first, we can not be held responsible if you are not then happy with the finished run either from an artwork point of view or if there is a problem with the audio, which has arisen from the master disc. TechnoVisual do insist on charging a one-off set up fee including sending you a full prototype for review, for all short run jobs including packaging with printed artwork eg. digipacks, printed card wallets, DVD cases and jewel cases and this charge is for sending you the relevant templates, for checking your artwork to make sure it will work with the package/disc you require, for setting up this artwork on our cutters and printers and finally for checking the printed colours against the screen. Once the prototype has been signed off, we ask for full payment at this point. We will not need to make this charge again if you return for more packs of the same type at a future date. We always keep a copy of your pack and disc plus the print specification used on file. Please see the packaging page for costings regarding the set-up/prototype for various packages supplied on a short run basis. DISC MATCHING - We do need to also point out that we will try to match the disc to packs if this is required as closely as possible, however the printing method and surface type is completely different for both products and if we feel we have to spend longer than usual to get a close match, we will let you know first as this will incurr further charges. TechnoVisual does insist that you take up our prototype/proof service for most of our printed packaging, however we do appreciate that there may be circumstances where you do not require the whole package and perhaps only require a run of printed inlays e.g. DVD case inlays. As we offer a printing service as well as the disc duplication, we are happy to break down these jobs to some degree and in such circumstances we would normally only charge a £6.00 plus vat proof cost. For more details please see our short run printing page. Delivery of CDs, DVDs or any other printed material will be made using a reputable 24 hour courier, and charged at cost. If within the UK and not over 10kg the charge is £11.50 plus vat. Packs up to 15kg are charged at £15.00 plus vat and up to 20kg at £18.00 plus vat. If the package is very small (under 1 or 2kgs) we will use Royal Mail as the cheaper option. Delivery of long run projects including CDs, DVDs, packaging or any other printed material will be made using a reputable courier and there is generally no charge for this, we would always make this clear in our initial quotation.